Meastar gur shiúl timpeall 10,000 Gael ar son cearta, cothromas, agus cóir don Ghaeilge i mBéal Feirste Dé Sathairn 12 Aibreán. Eagraíodh an mórshiúl seo mar chuid d’fheachtas náisiúnta ar son cearta teanga do lucht na Gaeilge in achan chearn den tír. Tá cúpla chúis leis an fheachtas seo; easpa cearta, easpa measa, easpa seirbhísí, agus an chúis ba mhó ná gurb éigean don Choimisinéir Teanga Seán Ó Cuirreáin éirí as a phost de bharr nach raibh an Rialtas ag tabhairt puinn tacaíochta dó nó do chúis na Gaeilge. I mí Feabhra eagraíodh mórshiúl darb ainm Lá Mór na Gaeilge agus bhí an Lá Dearg i gcomharba air. Cuireadh tús leis an Lá Dearg nuair a dhear an eagraíocht Gael Force Art na focail “AN LÁ DEARG” ar an Sliabh Dubh. Bhí sé le feiceáil go furast ó Iarthar na Cathrac, an Ceathrú Gaeltachta, an áit ar thosaigh an mórshiúl. I lár na Ceathrún, lasmuigh den Chultúrlann McAdam Ó Fiaich, bhailigh na sluaite Gaeil le chéile agus thug aghaidh ar an siúlóid dhá mhíle chuig Cearnóg Teach an Chustaim. Is ansin a labhair cuid mhaith cainteoirí don slua; gasúr ó Rann na Feirste a rinne aithris ar dhán dá chuid féin, girseach ó Dhoire a labhair faoin ghá le meánscoil sa chontae, múinteoir agus máthair ó Dhún Geannain a thug óráid faoin dóigh a bhunaigh sí Gaelscoil sa cheantar, agus faoi dheireadh ceann de phríomh-ghníomhaithe na Tuaiscirt, Caoimhe Ní Chathail, a labhair go hionsporáideach agus go bríomhar paiseanta faoi caidé atá i ndan don teanga amach anseo. Bhí ceol agus damhsa ar an stáitse fosta, agus go leor doirne san aer, spreagtha ag Tomaí Ó Conghaile, fear an tí ar an lá. Bíodh is gur mórshiúl síochánta ar fad a bhí sa Lá Dearg, bhí dornán beag frith-agóidithe ag seasamh i lár na cathrach, cuid acu ag déanamh comhartha Naitsíoch. Dílseoirí antoiseacha a bhí iontu, agus fiú bhí bratach an Aontais le feiceáil á chrochadh ag duine acu. Níor chuir siad isteach ar an mhórshiúl, áfach, agus ní fhacthas foréigean ar bith an lá ar fad. Agus Caoimhe Ní Chathail thuas ar an stáitse ag beannú an tslua, luaigh sí trí phríomh-éileamh a bhí leis an Lá; Acht na Gaeilge sna sé chontae, córas cuimsithe oideachais (meánscoil i gcontae Dhoire), agus achainní cuí do Phobal na Gaeilge sna sé chontae. Dúirt sí i ndiaidh sin uilig, narbh sin ach tús an scéil. Labhair The College View le Caoimhe faoi agus nochtaigh sí go raibh “acmhainní ag dul thart”. “Táimid á mbailiú le tabhairt suas daofa [dóibh], beimid ag cur litreacha chuig na páirtithe ag lorg cruinniú leo,” a dúirt sí. 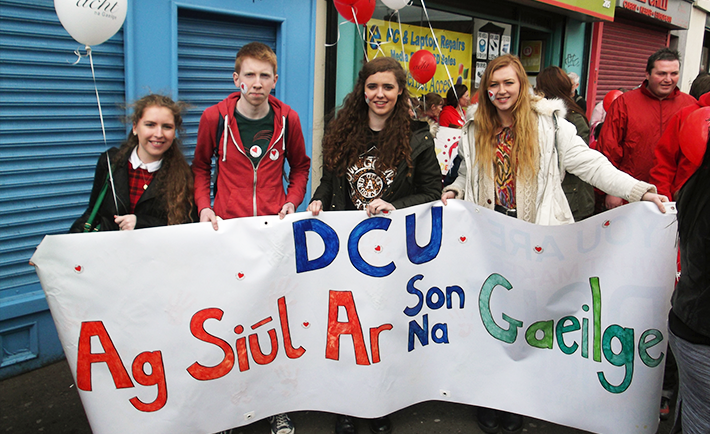 Rinneadh ionadaíocht mhaith ar son DCU ag an mhórshiúl; d’fhreastal ceathrar baill de choiste an Chumainn Ghaelaigh, ag iompar brataí leis na focail “DCU Ag Siúl Ar Son Na Gaeilge” uirthi. Úsáideadh an bhratach nuair a rinneadh ionadaíocht ar son DCU ag Lá Mór na Gaeilge i mBaile Átha Cliath i mí Feabhra fosta.